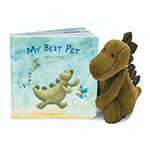 'My Best Pet' book along with Bashful Dino plushie is a fantastic set to give as a gift to any infant, child or anyone young at heart. "Ponies like to be outdoors, relaxing in the breeze. But dinosaurs snuggle up with friends, it can be quite a squeeze!" A dinosaur as a pet? Meet a stegosaurus that can skateboard and do magic - that's what we call a perfect pet! Puppy, bunny, parrot or kitten? The Best Pet is a book with a different suggestion. Read together with Bashful Dino for a truly Jurassic spark. The lovable Dino with that Jurassic Spark! Most dinosaurs were scaly and tough, but Bashful Dino is the softest stegosaurus we’ve ever snuggled! He likes to stomp around so his squishy spines wobble, and practise his adorable roar. But how did he get so gorgeously green? Perhaps it’s all that grass he’s been eating!